Helping People Realize the American Dream Serving Northern Virginia since 2008. Realtor Serving Northern Virginia's in Arlington, Fairfax, Loudoun and Prince William Counties. For current and interesting local market updates and features, search Facebook for “Kim Kroner Real Estate.” and Several new items are posted on the page throughout the week. By becoming a ‘fan’ of “Kim kroner Real Estate,” you will receive occasional updates including articles on the current state of the local real estate market and other information designed to help those looking to buy, sell, or add value to a home. If you are not a Facebook user, you may access the page by going to my website, www.KimKroner.com, and clicking on the Facebook logo on the home page. 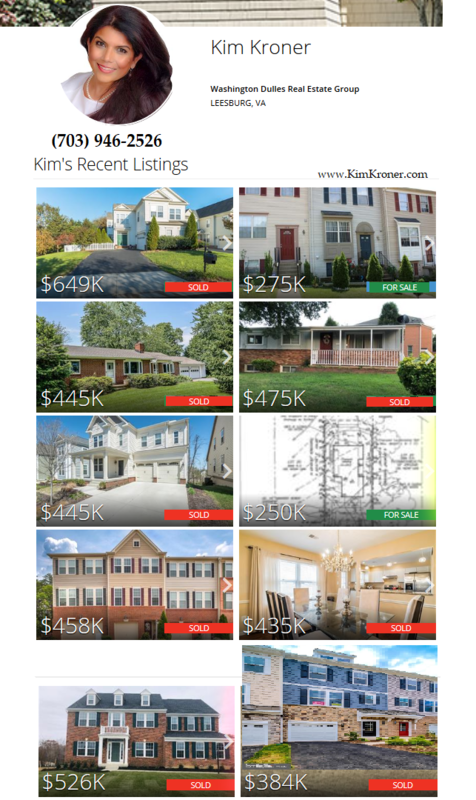 Kim Kroner is a Real Estate Broker and a Realtor in Luxury International Real Estate, providing expert service in the Washington DC suburbs with a primary focus in the neighborhoods of Arlington, Fairfax, Loudoun Counties, Falls Church, Alexandria in Virginia & Maryland. Kim also works with lenders marketing their bank owned listings and also work with those in the foreclosure process assisting with short sales and various form of loss mitigation. Kim Kroner's experience with International Real Estate, Luxury Portfolio International expands available offerings through powerful local and global resources. Kim's success is in part due to a keen ability to coordinate the details of today’s sophisticated transactions and direct a strong team in all areas from financing and one-stop-shopping to the latest online marketing tools. International business networking in the field of luxury building materials, luxury investment projects on a worldwide basis. Get a home value estimate today.